As promised, here is the first ‘now read, was unread’ book review (see previous blog article for details!). 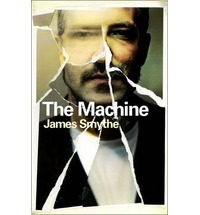 I had James Smythe’s The Machine on my bookshelf to read because it was listed in a ‘best dystopian novels’ article and was the only one listed I hadn’t read. Maybe my expectations were too high, but I have to admit to being rather disappointed by this novel. The protagonist, Beth, lives on a ‘rough’ housing estate near the sea in the south of the UK where the local kids terrorize the residents. Apparently sea levels have risen, temperatures have risen, it hardly ever rains any more and even when it does rain, it is very heavy and doesn’t help as the ground is too parched. But, rather than appear dystopian and challenging, it just seems as if it’s all just a bit hot and a bit of a nuisance. Life seems exactly the same as it is right now, everyone still appears to have jobs and housing, although water is rationed, and certain areas have been flooded so people have been relocated. And quite frankly, there are scary teenage boys in gangs hanging around every housing estate; you don’t need rising sea levels for that to happen. We slowly (very slowly!) find out about Beth’s husband, Vic, who came back from the war with PTSD and voluntarily went through an untested and controversial ‘commit/purge/replenish’ memory treatment that was meant to remove his war memories (and the subsequent bouts of aggression and bad dreams affecting him) and give him new, happier ‘false’, memories but has instead left him a blank shell, a vegetable. Beth is convinced she can ‘bring him back’ from his current vegetative state and tracks down a version of ‘The Machine’ that was used in Vic’s original treatments, in order to put back the memories that were taken from him initially, using the original files she kept back after his treatments. I don’t want to put in any spoilers so I will resist from writing further on the obvious plot ‘twists and turns’. I think my main issue is that the world this novel portrays just doesn’t seem very different, and certainly not any more dystopian, than society now. And it didn’t make me think about the ethics/moral code/attitudes being acted upon, which is one of the reasons I like reading dystopian novels. Another issue is that being inside Beth’s head all the time gets a bit wearing, she just isn’t very interesting as a character. Her continuing mental disintegration seems workmanlike when you compare it to the woman’s in The Yellow Wallpaper for example. And for all the mysterious hints about ‘The Machine’, they don’t really come to much. In summary, good concept, well-written with good descriptions of PTSD but could have been much more. However, don’t take my word for it. I read quite a few reviews on Goodreads, after reading The Machine, and it has received lots of positive reviews so maybe it’s just me!